One of South Korea’s largest phenomenon has reached our shores, and he has a permanent home here too! With his distinctive eye-wear, round face and colourful personality, he has captured the hearts and attention of many in Singapore. No, I am not talking about PSY of Gangnam Style fame. It's Pororo the Little Penguin. The bespectacled penguin Pororo and his Antarctic friends Petty, Crong, Eddy, Loopy and Poby are superstars to little ones in South Korea. In fact, Pororo is considered to be the 'President of Kids' in South Korea! And with the opening of the first Pororo Park in Southeast Asia at Marina Square, chances are the kids here will adore him and his cute friends just as much too. Billed as the largest character-themed indoor playground in Singapore, Pororo Park Singapore morphs 11,000 square feet of indoor space into loads of edutainment fun complete with a train ride, indoor structure playground, educational classes, entertaining shows and of course, mascots meet-and-greets too! A ball pit is a mandatory feature in any self-respecting playground and even better if it is darn huge... with its base and sides fully padded! Toddlers will have a field day jumping in and swimming through the many plastic balls. Okay, actually older kids like the monkies too. From the outside, this huge structure playground may look pretty normal but it was where the boys spent most of their time... and enjoyed the most. And they have got the heads of (yucky) perspiration to prove it. Full of climbing structures, ramps and slides, the Jungle Gym's interior is extremely well-padded. A plus point for parents of toddlers is the structure is not too big so it should be relatively easy to spot your kids from the outside. Fans of the cartoon series should recognise this. The exact replica of Pororo’s house comes furnished with a bed, sofa, mini fridge and even a bathroom. An extension of Pororo's house, Crong's Backyard is a play area littered with role-playing sets. A good place to chill if the other attractions in the park get too crowded. These two rooms are perfect for a Pororo-themed birthday party. In addition, they function as educational classrooms for kids' workshops such as Petty's Art Class and Eddy's Science Class. for a start, reading classes conducted by instructors from MindChamps will be held every Sunday from November 2015 to January 2016. This will most certainly be the first thing kids set their sights upon entering the park - a train ride and the iconic centrepiece of Pororo Park. The train takes kids on a slow ride through an icy cave and is suitable even for toddlers. Expect the kids to go on it more than once! What's a Pororo Park without live performances? 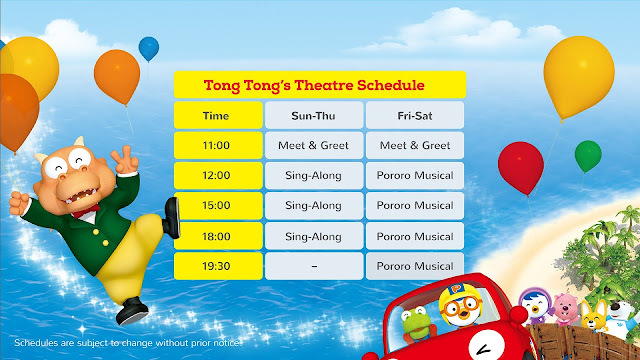 Kids can jive, groove, clap and sing along to the ditties that Pororo and friends dish out at the theatre. #Pororo dance fever descends onto Marina Square. I have to admit, some of the songs sounded pretty nostalgic to me... simply because they were some of Ayd's favourite songs many years back and those exact same songs were on repeat mode in the house. So my advice is do NOT miss the performances while you are there because your child will love you for it! And of course, I guess I do not have to tell you the Meet and Greet Sessions are a must as well. Scheduled meet and greet sessions are at 11am every day but impromptu parades around the park and appearances by the characters are highly likely too! desserts. There is free Wi-Fi too, if you must know. Rody’s Toy Store, which is located outside of the park, stocks a good variety of Pororo and friends-themed memorabilia, ranging from toys, stationery to kid apparels and other souvenir items. To be honest, my first impression of Pororo Park Singapore was that it is simply just a glorified indoor playground. There is the indoor gym, ball pit and role-playing sets which are what other indoor playgrounds have. But the longer I spent in the park, the more I got to see the many smiling faces of kids tottering about... and their joy primarily came from the train ride, darting in and out of Pororo House and the opportunity of watching Pororo dancing 'live' in front of them. Pororo Park is targeted at kids aged between one and nine, but I feel a more appropriate age band is between two and six instead. They will be the ones who will be delighted to spend a full two hours within the park and compared to flying to Seoul to meet Pororo at the theme park, this is definitely the more economical option for parents! The lucky winner has been picked! Congratulations to LYNN CHEN for winning the Family Package for 2 children and 2 adults to Pororo Park Singapore. Thanks to Pororo Park Singapore, I have a Family Package for 2 children and 2 adults (worth $79) to give away! Tickets are valid until 31 December 2015. Giveaway ends on 17 November 2015, 2359 hours. *Toilets and a changing room are available within the park. This playground looks fun for my girl! Hope I can win the tickets for a great bonding session with my boys! My children will be thrilled to be here!! Cool! The kid will love it! Liked & Shared in Public. Me me me! My 5yo and even my 22mths old are mega fans of pororo!!! Gonna be super kiasu n comment on ur fb too lol. My boys are Pororo fans! They will absolutely facinated seeing Pororo for the meet & greet session. My boys are Pororo fans. They will be facinated to see pororo at the meet and greet session. ✔All done! Hope to win! I would like to win these tickets for my nephew, who is a Pororo fan! Liked, commented and shared! I'm sure my kids would love it there! Looking forward to bring my little girl there!! The tickets are just nice to my family.. my 2 kids like pororo so much.. we went there and took the photo session. Hope we will win this time... thank you so much. Hope to win the tickets then I could bring my boy there on his birthday! Hope to win the tickets for my boy coming birthday on 16 Nov! Like, shared and comment on both side!! Hope I can get the tickets as my girl saw it while we were at marina Square yesterday & she was so excited but it was not open yet. my kids love pororo! what a great giveaway! Looks great! Never won a kids prize before so hope to win it!. I want to visit! More for me than the kids! Avid fan of Petty and Loopy, my gal loves them! Hope we will be lucky. We love Pororo! Sure hope to visit! Hope to check it out! Hope to win as my girl birthday is on 19 November and I can bring her there. I'm pretty sure my girls will love their play there! Liked Pororosg Facebook page too! Liked and comment here. thanks for the post! Erm..... Not sure if this is a hoax. Nevertheless I shall give it a try in the name of Love for my kids. Had like and share the page. May Christmas come early for my kids! Hope I can win the tickets for my girl who is crazy for Pororo! Yeai... 2 hours of happy kids, here we come!!! Let me be the lucky one. My gals will be jumping with joy in Pororo land!!! I saw your preview post have a lot fun and exciting activities, me and my kids was stunning and looking forward to go Pororo Land. Hope to get luck as my birthday on 11 Nov same as opening day, thanks! Liked and shared! Hope to be able to bring both my boys there. They'll be thrilled! I hope to win. My boy loves Pororo! Hope to win the tickets as my daughter is a huge fan of Pororo.thanks. Hello!! Thanks for sharing with us a chance to win tickets to Pororo playhouse!! Liked the facebook page and shared this post already! It's my daughter's dream to the enter the world of Pororo and Friends. It will be a great trip for them if they win the tickets! Thank you cheekiemonkies for sharing about the place and the giveaway. Thanks to the Pororo park for providing this giveaway. Hope I would have the opportunity to go with my family. Really hope to win and bring my kids there. Will not have a chance to go oversea as I have a 10 months baby so hopefully can get this package for his big sister who is now jerlous of him to show that we still loved her. Hope to win tickets to bring my little girl. All liked and shared on facebook! All done for Liked, shared and commented. It would be great to win an awesome giveaway for my little cuties who are looking forward to go. Be it as an early X'mas present or surprise for my little ones. My son loves Pororo. Hope to win the tickets! My girls Pororo Hope to win a family's tickets! Thank you for the writeup! It looks like a fun place! Hopefully we win some tickets to go for free! Like and commented. My kids and I love the characters! This is a super duper cool indoor playground for all the little ones. I really really hope to win the tickets for my little girl who loves Pororo and friends very much!! She will definately fall in love with this place . So excited and looking forward to bring her there to have a wild time with all her favourite characters . I have liked and shared! Hope I can be the lucky one so that I can bring my daughter to this first ever Pororo playground!! "Snow covered wonderland Make way for Pororo Always happy, as can be Everyday a new adventure waits for me Call for him my Little Penguin Porong Porong Porong Porong Porong Porong Porong Porong Po Ro Ro I love to play all day Come join me all my friends Always happy, as can be Porong, Porong, Porong, Porong, Po Ro Ro!!" Ok.. done. Liked,comment and shared. Thank you cheekymonkies for letting us know this great give away. Hope to win it for my 2 yrs old and wife they will be so happy. Once again thank you so much. Good day. Looks like good fun for the kids! All done. Hope I can win this package. Will like to bring my family to Pororo Park. Like and shared.. hope to win to bring little one to distress..
Facebook name is kindbear koh.. Liked and shared! Hope to bring my 5 yr old to his Fav Pororo playground as a birthday treat! Hope to experience the magic of pororo land with my girl who loves pororo! Hope to win tickets to bring my son during his school holidays. Hope to win tickets for my boys! they will be delighted!